Whether your team is completing a project or performing mid-phase inspections, punch lists and quality control go hand-in-hand. Ensure your projects are completed within spec and on-time with Punch Lists. ConstructionOnline™ Punch List Management includes a powerful combination of cloud-based desktop construction software and mobile applications for iPhone, iPad, and Android. Easy to use Punch Lists that help you close out your jobs faster. Without the right tools, Punch List Management can be a painful process, especially when it comes down to the end of a project. 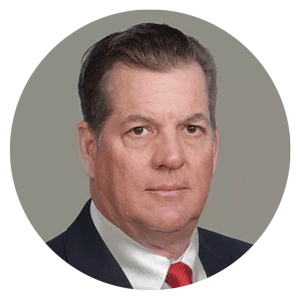 In many cases, you are dealing with dozens of subcontractors and suppliers needing to work seamlessly together to complete the project, relying on you for specific details and information about their responsibilities. New ConstructionOnline™ Punch List Management has been designed to empower you and your entire team to quickly create, document, photograph, and assign punchlist items from the office or jobsite. Harnessing the latest technologies in cloud- and mobile-based systems, ConstructionOnline™ Punch List Management is the new industry standard in quality control construction software designed to build your business. As the world's fastest growing online construction software, ConstructionOnline™ is a product of it's own success. A big part of the momentum is a result of focusing on the importance of designing products that are easy to use and easy to understand. Not just for you, but for everyone on your extended project teams needing to access ConstructionOnline™ via the web or through an iPhone, iPad, or Android device directly from the jobsite. 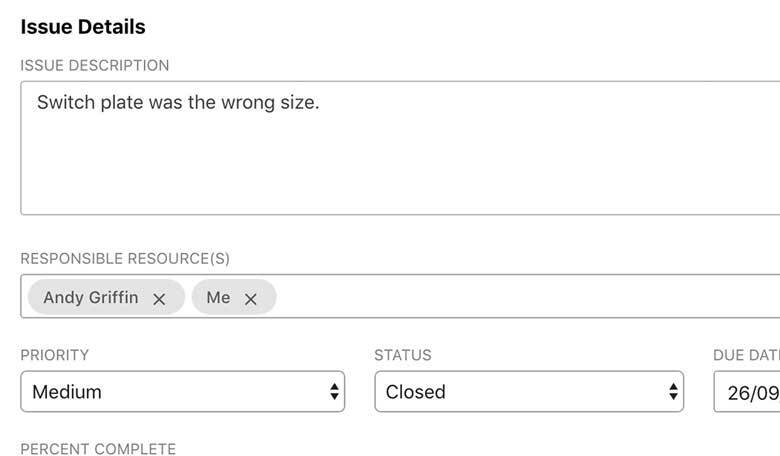 ConstructionOnline™ Punch List Management makes it easy to quickly enter items and issues, add optional details, photos, videos, and more. On top of that, you can track your progress with the click of a button - easy to use, easy to understand. For those projects requiring extra attention, ConstructionOnline™ Punch List Management offers powerful tools to add structure and detail to your quality control needs. Under each project, optional folders and subfolders of items can be structured to best address the requirements and scale of your project. These lists can be defined and organized by phase, classification, date, draw, or any other grouping that mirrors the structure of your project. 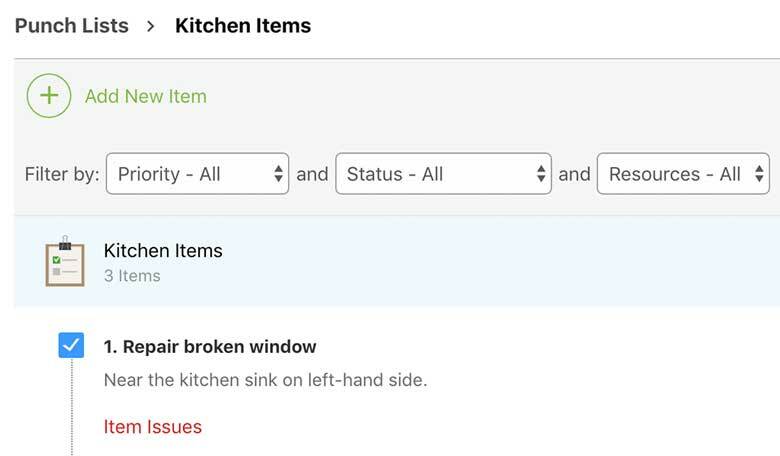 In addition, items can have optional sub-issues assigned in cases where an individual punch list item requires multiple improvments or resources. Keeping track of the status of your Punch Lists is a critical factor in successfully completing projects on time and on budget. 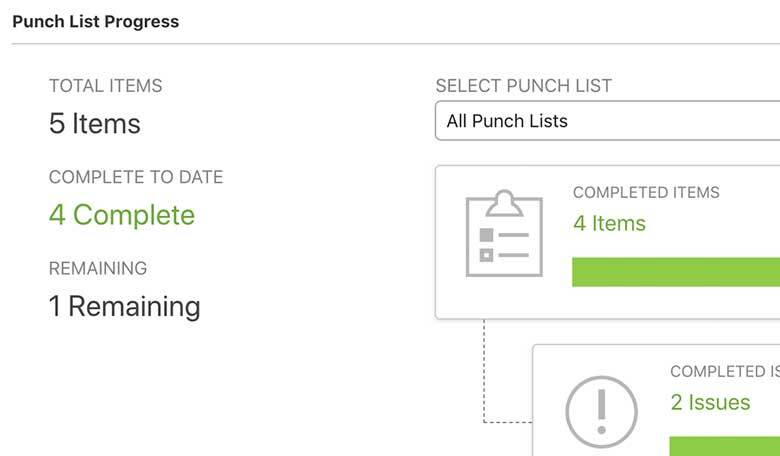 ConstructionOnline™ Punch List Management allows you to easily track Priority, Status, and Percentage Complete of every individual punch list item and issue. 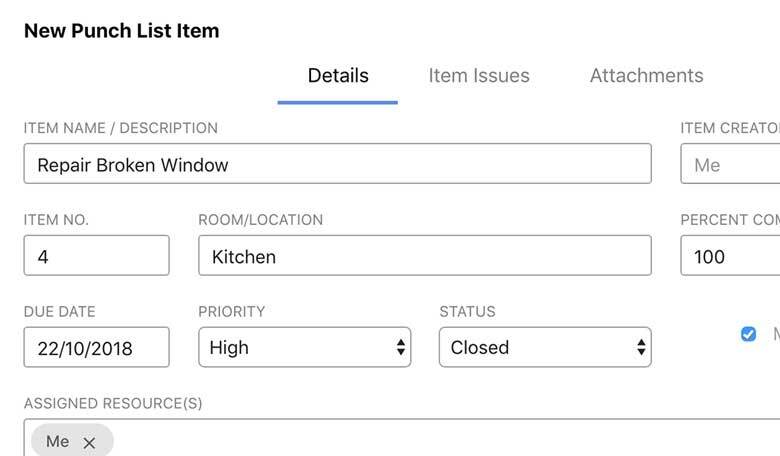 Quickly share or print punch lists allowing your team to remotely adjust status or add notes from the convenience of their iPhone, iPad, or Android device. Predefine comprehensive inspections lists that can be shared with field personnel in a constant flow of specifications, best practices, and inspections that significantly improve the quality of deliverables, while also reducing the time and expense required to redo or repair incomplete or unsuitable work.